Opened in 1992, the dentistry office of Dr. Julie Gillis was established in order to provide patients with comprehensive and cosmetic dentistry available in a hygienic and relaxed setting. When you enter our tranquil, beautiful office, you’ll feel as if you’ve traveled across the globe to the Greek Isles. Relax by our fountain while enjoying the beautiful artwork, and prepare to enter a world where art and science are combined to create beautiful and healthy smiles. 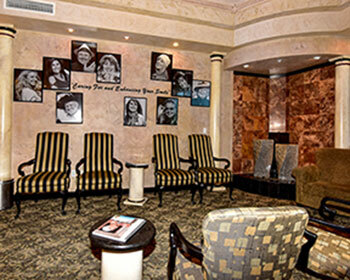 Our office utilizes state-of-the-art technology to provide the highest level of care. Since we added solar panels to the roof of our dental practice in 2009, we have reduced our carbon footprint an amount in excess of 35,000 pounds of carbon dioxide every year! Our digital X-ray system uses 50 to 90 percent less radiation than old fashioned film X-rays. It enables us to quickly and effectively check your teeth and the supporting structures for decay and other problems. The highly-detailed image of your teeth on our computer screens, which patients have access to in every one of our treatment rooms, allows you to see for yourself any problems which need to be addressed. By using intra-oral imaging, we capture digital images of teeth for review on our video monitors. This makes you an active partner in your dental treatment by allowing you to see what we see inside your mouth. The DIAGNOdent laser assists us in finding tooth decay in some of the earlier stages. The laser is shined into your mouth and allows us to see weakened areas in the tooth that may be indicative of a forming cavity. This helps our staff and you because we catch decay very early before extensive damage is done to teeth. The proper treatment will be less time-consuming and extensive than it would be without this laser. Our diode lasers help us treat you comfortably as we eliminate dangerous periodontal bacteria, recontour your gums, or treat a canker sore. Because of their precise nature, you often do not require anesthetic during your procedure, and we’ll be able to target the necessary tissue while leaving the neighboring healthy tissue untouched. Air abrasion is a drill-free option for removing a minimal amount of structure for tooth decay in its early stages. There is no vibration or heat and the procedure usually does not require anesthetic – a big plus for many patients! We have been coming to Dr. Gillis for years now and have always had the very best care! Dr. Gillis is always on top of new solutions including how to keep us comfortable. Most of her staff has been with her for years as well, and they are trained and professional and fun. It is a smooth running, beautiful, and comfortable office committed to taking good care of every patient. We would highly recommend Dr.Gillis and her team! While you receive treatment in our Grand Junction office, our highest priority is to ensure your comfort. We keep the following amenities available for our patients. We want to exceed your expectations for a great dental experience. Please contact our office to schedule an appointment. Dr. Gillis provides dental care to patients from Colorado and Utah. Several of our patients hail from Grand Junction, Fruita, Clifton, Palisade, and Orchard Mesa. We are eager to address all of your dentistry concerns while we provide excellent treatment. You can also learn about our payment options by visiting our section on dental financing and insurance.